Saltillo tile is a beautiful Mexican tile that is made by hand, poured into molds and kiln- or air-dried to bring out its color and beauty. Staining saltillo is a great way to update the saltillo in your home without the expense and effort of ripping out the old tile. 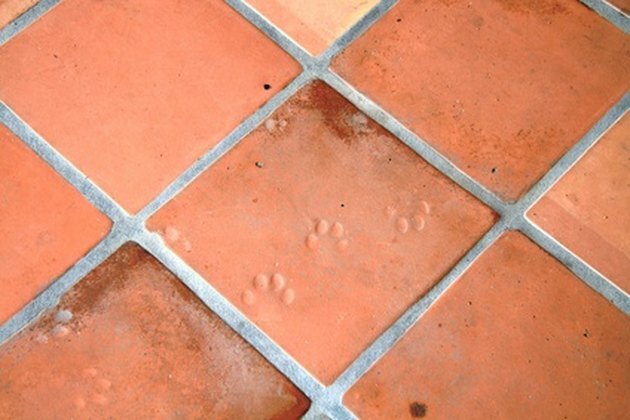 Keep in mind that saltillo is a very delicate tile and is easily damaged by standing water and other misuse. It is recommended that you consult a professional for this type of project. If you decide to refinish your saltillo yourself, follow the product instructions carefully and keep the area as dry and clean as possible. Vacuum the area thoroughly to remove all dirt and loose particles from the floor. Mop the floors with a solution of one part vinegar and two parts water. Use a towel to wipe up the water as you go. Apply a chemical stripper to the saltillo tile to remove the top layer of sealant. Removing the sealant will allow the stain to penetrate the tiles. Follow the manufacturer's directions for the length of time you should leave the chemical on the tile, usually 20 minutes. Use a slightly wet brush to scrub the sealant layer from the top of the tiles. Mop the floors using the vinegar-and-water solution. Follow closely behind with a dry towel to mop up standing water. Cut a large sponge into pieces about the size of your palms. Dip a piece of sponge into the stain and begin applying it to the tile in a circular motion. Apply two to three coats of stain until you get a look that you like. Allow the stain to dry completely. Seal the floors using a sealant formulated for saltillo. Sealants come in finishes ranging from glossy to matte. Any finish will provide the same protection. Choose the look you like the best. Allow the sealant to dry completely before allowing foot traffic on your newly stained floors.